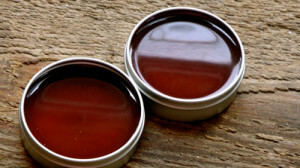 Rosalee of Learning Herbs developed this simple and effective Cayenne Salve that you can make at home. It uses just 3 ingredients. Cayenne has been shown to reduce the pain of diabetic neuropathy, shingles, migraine headaches, back aches, muscle aches, arthritis, menstrual cramps and bruises. Cayenne gets its heat from capsaicin. It reduces pain by working on the nervous system. Substance P is a peptide in our bodies that transmits pain signals from the sensory nerves to the central nervous system. So for example if you have a back ache, Substance P helps communicate that fact to your central nervous system and you feel the back pain. If you apply a cayenne pain salve to your back, the capsaicin in the cayenne helps to block Substance P and therefore reduces your feelings of pain. It’s really an amazing mechanism. Click on the Homemade Cayenne Salve for Pain Relief link below to see the complete recipe.